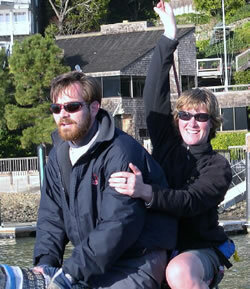 After our experience on Yeoman on the Fastnet one of the crew had a good idea about how to set a trysail effectively. After reading one of the books about the Sydney Hobart race a few years ago I took away the thought that tying the boom down on deck caused damage and some safety issues and if possible it was better not to have to do this. A few boats had problems when the booms were lashed to weather and the helm as a result couldn’t see the waves coming from the weather side. Waves hit the boom and broke it loose taking out stanchions, helm stations and people. Â So when we went to hoist the trysail we sheeted it to the end of the boom using the outhaul which we had pre set while at the dock. What I didn’t think about was that the outhaul didn’t have enough slack in it to allow the trysail to be ‘flogged’ while luff tension was taken up so instead you had to use the mainsheet to let the boom out but the boom was really low and therefore was a bit dangerous. We did get it effectively hoisted but it then pulled out of the track due to an over size luff rope – a different issue all together. Â So the idea that was put forward and makes sense is to put grommets in the luff and wool the trysail passing the wool through these grommets and around the rolled up sail. You would then store the trysail as a banded snake. Using a reef line you have unreaved from reef 1 you tie that to the clew before hoisting the sausage up the main track. After getting the luff tensioned how you want it you then pull the reef line to unband and ‘sheet’ the trysail. When I next have the undesirable chance to try it out I will tell you if it works in reality. I was rebedding a pulpit the other day and the pins in the lifelines were put in the opposite of the above picture. I explained to the owner that I like to put them in as above as if the ring ding for some reason backs out and the boat is heeled the pin will either fall into the boat and you have a possibility of saving it from going overboard or it stays in place due to gravity. I really prefer lashing them on with spectra with the line going around the 1″ round. 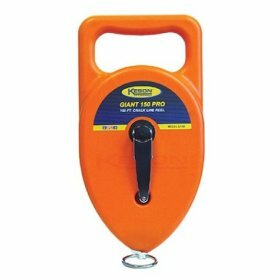 You are therefore not relying on the spot welds on the loops,Â there are no pins to go missing and if you have a man overboard you can knife the top lifeline to make it easier to get the MOB back onboard. Â I also had another pulpit that sheared so I to relead the bow light electrical as it was damaged and I couldn’t fish the end back out. I used fishing line and a pencil sinker pushing this into the hole in the pulpit and then jiggling it back and forth to get it around the twists and turns. Sounds easy but time consuming and frustrating. This video was not taken from our boat but it shows the fun that was had by all at the mark rounding in light air! No wind but lots of activity! 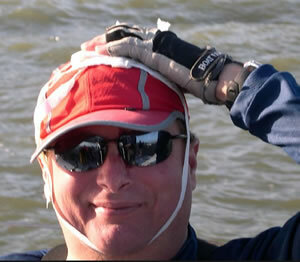 This last weekend I raced on Astra in the CYC midwinters doing bow. 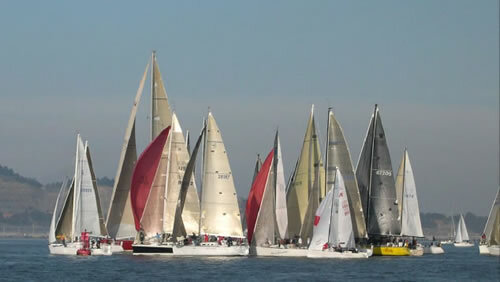 There was a large ebb both days with less than 10 knots of wind for the start on saturday. Within .5 mile of the start we were anchored of Point Stewart. Half the fleet decided toÂ leave Angel to port the next mark was Southampton Shoals.Â Boats that didn’t anchor vainly tried to overcome the growing ebb with less and less wind and it was time to get the fenders out to protect the boat from unwelcome visitors! Finally a wind line worked it’s way down Racoon Straits and we pulled up the anchor which had a fishing net complete with starfish and seaweed attached to the flukes. Guess that’s why it wasn’t holding that well! Off we went working the Marin shoreline tacking back and forth staying in shallow water to get out of the river of tide we looked like heros outÂ in front of theÂ fleet. ThenÂ the anchor went down again as we popped out of Raccoon straits and were getting pushed to Treasure. The fleet converged at the red number 10 bouy and there was lots of yelling, mayhem and fiberglass crunching. Astra got through unscathed as the boats behind cleared away to either side allowing the wind to fill the spinnaker while everyone else was blanketing each others spinnakers. We reentered Racoon heading for the finish with almost 10 knots of breeze unfortunately in one of those last tacks one of the crew badly lacerated his head. While crossing under the boom by the vang his foot caught on the halyard and he head butted the turnbuckle on the new weather side creating two cuts one triangular shaped 1 1/2″ on each side and another straight laceration of 2″ long. There was a large amount of blood and pressure was applied with numerous guaze pads. We put his hat back on so that we could tape the pads to his head without sticking to his hair. He really did put on a brave face. Mary the owner and the crew member spent 3 hours in Marin Emergency room and 7 stitches later he was sent home with some pain killers. Due to some dredging near the enterance to SFYC there is an issue getting the boat into the harbour at the moment.Â The silting in didn’t even allow us to get to the guest dock on Friday. So we ended up boom riding to heel the boat over as much as possible both Saturday and Sunday to get into the dock after racing. Sunday was a lot less exciting – just a standard day of racing ! The race was only an hour long as the wind was consistent. I have been building a new boom for my brother’s moore 24 and also finishing off the mast which we bought from Buzz Ballenger. One of the important things to think about when making the holes in the mast for fittings is to make sure you use a file to round of the corners of any rectangular cuts made for sheaves. This is important whether it is a carbon mast or an aluminum mast. Last year we had the unfortunate situation of falling victim to a hole that was cut in the mast, the corners were not rounded offÂ and the hole was oversized (at the time we were winning our class) we ended up retiring from the regatta due to the subsequent mast failure (see picture). N.B.Â The hole was not cut by the mast manufacturer but by someone after the rig had been delivered. I use cardboard to create a template for the fitting that I am installing on the mast. I then trace the template onto the rig at the correct point, drill a large hole and then use a jigsaw to cut the section out. Next I take a file and make the hole the correct size for the fitting taking off a little at a time. Lastly I take a rat tail file and round of the corners. I take some electrical tape and use it as an insulator between the stainless and the aluminum by taping the plate and then using a razor to remove the excess tape. I use tefgel on the screws or rivetsÂ that hold the fitting in place to stop the electrolysis between the two different metals. This last weekend a group of us went on our annual ski trip to Tahoe which is always the 2nd weekend of February. We rent a large ski cabin owed by a school friend of mines family. It is a great cabin near Tahoe City that holds 10 people. A few people cancelled last minute so we ended up with only 6 up at the cabin. 4 out of the 6 are French so I had a good time trying out bad French and trying to understand them! Scott was cross country skiing so he kindly took Draeger the dog out for some trail walks. I tried to stay up with the French on the slopes. My skiing is functional and not stylish at all – oh well for a person that goes once a year. IÂ stuck with them even on the double diamond black which I almost bailed on and started the long walk back on the catwalk then decided I was being old and did it anyways. Allez op was the call on the slopes all weekend. The snow was amazing I have not ever seen it that deep in theÂ last 8Â years I have been going up there. It was spring skiing conditions – very warm sun but not slushy snow. We skied Homewood on Saturday with the beautiful views of the lake and Alpine on Sunday where we had a picnic at the top of the mountain. We made our skis into lounge chairs! A very enjoyable weekend. 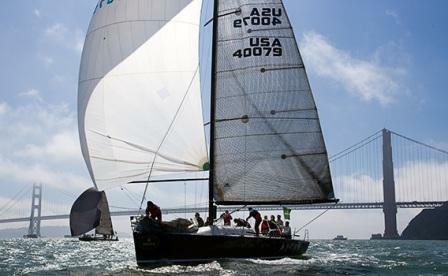 – one short blast to mean “I am altering my course to starboard”. – two short blasts to mean “I am altering my course to port”. – two prolonged blasts followed by one short blast to mean “I intend to overtake you on your starboard side”. – two prolonged blasts followed by two short blasts to mean “I intend to overtake you on your port side”. After spending way too much time untangling messenger line I decided what was needed was a cassette that would house the line and allow me to go up the mast and drop a tag line down inside the rig easily. The result was a search for industrial chalk lines that took me to Amazon.com where I buy Keson G150 Giant Chalk boxes.Â The cassettes will hold up to 150 feet of tagline. What I do is remove the chalk line and replace it with dacron tagline from Svends. I then go to the local bike shop and get some used bike chain. I cut sections about 8 inches long and I can tie this to the tagline. To stop the bike chain from wrapping around spreader bars in the rig take some electrical shrink wrap and shrink wrap the bike chain. The result is a long thin weight that will allow you to swiftly drop a new tagline into the rig from the masthead. The chain is flexible enough to bend into the rig over the halyard sheaves. When you want to coil it up you just open up the handle and with 3 to 1 ratio it is cleanly housed in the box with no tangles. I had a great weekend doing my two favourite activities – sailing and cooking. 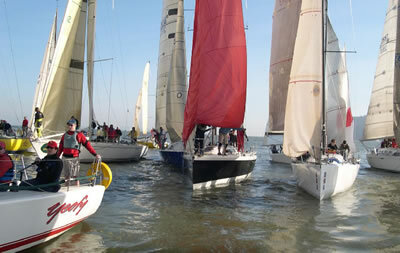 I raced Astra the Farr 40 on Saturday and cooked Sunday for a superbowl party at Mary’s. The kitchen at her place is the size of my house! We did a mexican feast for dinner and had fruit tarts and expresso chocolate cake for dessert. Â I am now official ‘over the hill’ being 30. Not sure I am into it – so far I had a ‘birthday’ card from my health insurance company saying my premium is going up as I am now in a higher risk age group! I’m not sure out about that they obviously don’t know what I did in my 20’s.